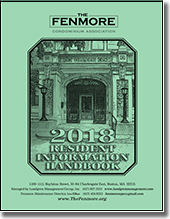 The Fenmore is a residential condominium complex of 205 units in seven buildings located at 1109 and 1111 Boylston Street and 64, 60, 56, 52 and 50 Charlesgate East. Built around 1912, the Fenmore typified the genteel, upper-middle class apartment hotels which had become fashionable in the newly-developed western or lower Back Bay during the 1890s and early 1900s. It boasted such amenities as an office staff who would receive packages or call one a carriage for a trip to the shops in Copley Square, maids who would change the linen, and a house-keeping service which would tidy up by using the latest in centralized vacuum systems, remnants of which can still be seen as round, brass-capped baseboard outlets in some units. 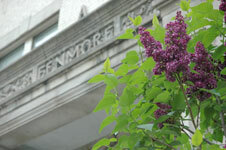 The Fenmore Condominiums are located at the east edge of an area of Boston called the Fenway. Named for the marshy areathe Back Bay Fensformed by the Muddy River flowing into the Charles, the Fenway is bordered by Massachusetts Avenue, the Massachusetts Turnpike and Park Drive. The Fens itself is home to Roberto Clemente Park which contains two baseball fields, a track and basketball courts; the Fenway Rose Garden and the Fenway Victory Gardens. Of course the most famous landmark in the Fenway is Fenway Park, home of the 2004, 2007 and 2013 World Series Champions, the Boston Red Sox. Other nearby points of interest are the Museum of Fine Arts, Symphony Hall, Berklee Performance Center, Isabella Stewart Gardner Museum, Kenmore Square, Newbury Street and the Prudential Center. Our neighbors on the Boylston-Charlesgate East-Ipswich block are the Fenway Studios and Saint Clement Church. 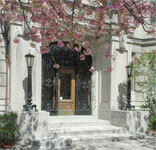 The Fenway Studios, built in 1905, contains 46 studios where resident artists live and work. In 1998 the building was designated a National Historic Landmark. Abutting the Fenmore Condominiums on Boylston Street is Saint Clement Eucharistic Shrine, home to the Oblates of the Virgin Mary. The Fenmore is conveniently located near public transportation. The closest subway stop is the Green Line Hynes/ICA stop on Massachusetts Avenue between Boylston and Newbury Streets. Other close stops are Kenmore Square (at the Commonwealth Hotel) and the Fenway stop (off Park Drive).